dwelge 2 months, 1 week ago. For almost everybody, now’s a good time to apply the January patches. As usual, there are some tricks. Details coming in Computerworld. You can go ahead and install Group A — the Monthly Rollup. It won’t bring in the Office patches. The Silverlight patch is not one of those two that are meant to fix a problem with IE11 not displaying correctly calendar dates with the Japanese year in them. One needs the Silverlight patch if one has Windows 7 and uses IE11 for streaming videos from Netflix and some other sources. That is so because IE11 for Win 7 does not support watching streams that use the new HTML5 standard, such as those from Netflix. But IE11 for Windows 8.1 supports it, so Silverlight is not needed by Win 8.1 users. Well, I can read German (mostly) and this is just plain weird: the Silverlight patch is, indeed, to fix the Japanese date issue in Silverlight… Seriously? I finally bothered to check by googling the update KB in the corresponding MS Web page (I run Widows 7, but use Chrome for Netflix, not IE11, so I have not been paying attention to any of this), and this was confirmed to be the case, indeed. But I disagree with the statement in the German article that (I translate) Silverlight “is long dead”, because it is definitely not for the type of user running Windows 7 and using IE11 for streaming video from Netflix, etc. that I have described already in my previous posting. and why do i have to install group a monthly rollup when i’m group b (security only)? i thought, installing any group a patch would propel me to group a with all its sniffing malware? Even regular visitors here can not be expected to remember who is Group A or B, especially those who are on other operating systems. It may help, so you don’t have to repeat yourself, to put your Group in your signature. You might notice other things that matter when asking a question, such as processor, or brand of computer, laptop or desktop, etc… and those can go in your signature as well. I was able to do it following Kirsty’s instructions, in How to Add a Signature to Your Profile. By the way, you aren’t alone in wanting Microsoft to develop and offer something better for the end user. I’ve had to time myself out in the Rants section, when I get too riled up about it! thx, Elly, i just edited signature. i encountered something weird: i edited signatur while using firefox. anf firefox already shows signatur under my posts. but google chrome did not. it took minutes for chrome to display signature… something similar i encountered yesterday already. it took chrome several minutes to display edits i made to my posts. even restart of chrome doesn’t help… what is this? where is this delay coming from? Personally, I would remove Silverlight from Windows. Very few sites or services need Silverlight without offering a comparable user experience which does not use Silverlight. The same goes for Adobe Flash Player. These two players (Silverlight and Flash Player) are security nightmares which require constant updating. Definitely not worth the effort in this day and age when almost all web and app content can be delivered with HTML5 and DRM. Now that it’s Defcon 4, I’d like to repeat my question about KB4461614 and KB4462157 here, since they went unmentioned in the article. There have also been reports that KB4462157 also breaks things. Should we avoid these two patches altogether? Unless you need support for the new Japanese calendar, I wouldn’t bother with either of them. Just uncheck anything that’s checked, and figure MS will fix it next month. Or the month after. Woody… if we “unchecked anything that’s checked” as you stated there wouldn’t be anything to install. I think maybe you might want to re-word that advice? Good point. I meant uncheck any Office 2010 patches…. Woody, do you really mean we shouldn’t install any of the Office 2010 patches? I have 5 offered, only one of which (KB4461614) is unchecked. Clearly I’m not installing that one, but do you recommend that I don’t install any of the checked ones either? From what I can see, Woody doesn’t see the Office 2010 updates as being for critical issues, and that its just better to wait until its all fixed, hopefully, next month. Susan lists only one of the patches as still causing problems, in her Master Patch List- KB4461614, and that one has an additional fix- KB4462157. The initial patch is to fix problems with the Japanese Calendar, and it causes problems with Office 2010 Access and Excel. So, unless you need the Japanese Calendar fix and use Access and Excel, you probably don’t need to apply these, and can safely wait until next month. No, just the one (KB4461614, which is already unchecked on my WU list). @charlie – That’s how I interpret it, that we ignore the unchecked KB4461614 and also the checked KB4462157 as that simply provides a fix for the unchecked one we’re not installing anyway and therefore isn’t needed – but that we install the other Office 2010 patches (which for me are KBs2553332, 4461623, and 4461625). However, that doesn’t square with Woody’s comment that we should “uncheck any Office 2010 patches….”. I assume that he (as well as Elly in her reply to me) was only talking about the two specific patches KBs 4461614 and 4462157 but I was hoping Woody would be able to confirm that rather than have us trying to second-guess what he was referring to. Thank you, Woody and Ed! I will go ahead and install KB4462157; if something breaks, I’ll be sure to let you know. Is this OK? If not how do I easily exclude it? I wouldn’t touch the Monthly Channel. Best to stick with Semi-Annual Channel, or Targeted. It’s actually difficult to move to Monthly Channel. Which is good. I was offered KB 4480970 the first week on windows 7 machines and did not install. I have not been offered it again since that first week, also on server 2008 R2 which I was never offered it. Should I install it from the catalog or just wait til Feb patches come out. If it isn’t checked, wait. There’s nothing all that pressing this month anyway. I installed, kb4481252, kb4481480, kb4480970, kb890830. No problems as far as I can tell, not even with Media Player. Do you have a home network with administrative privileges on all computers?? Ditto for my Win7 Home AMDx64. KB4481252, 4481480, 4480970, 890830 installed without issues. Locked back down and on to next month. Win7 Pro x64 Group B. If there were no critical fixes in January for Win7 and there are issues with networks with KB4480960 which may or may not be repairable…, hot fix or not, why not give it a miss and/or see whether MS will fix it in February??? Has anyone see issues with installing the new Windows XP updates that MS release and Office 365 ? Our department is still working with MS support and payment made to get updates for XP but this month updates seem to have broken something with XP and Office 365. MS support is slow in responding with a resolution for the issue we been having. We had one report that it broke Office 2010 on XP also. Yes. We have. MS is not responding even thought we paid them extra money this money as they requested. Only option we found so far is to uninstall the updates and remove the meltdown and spectra updates as well. This seems to fix the issue with Windows Xp and Office 365. Our company are currently test out another OS, call ReactOS so that we can stop paying MS for support of Windows XP. Your company might want to start look into it as well. MS is slowing becoming useless. We are still planning to stay and pay from MS Windows XP support until 2021. After that, we will see if paying for XP support is less than replacing our hardware. Right now XP support is only a few million dollars and new hardware will be in the billions so that is the reason for stay with MS support payments. Plus several programs do not work on new OS. We tried VM for XP but that had issues as well. Quite so, Woody, I wholeheartedly agree! Such a great truth, not just for this month, but for all of our lives. What about the jet Database bug in this months update. I have at least 4 win 7 computers using this database — what do I do — The feb preview updates do not fix the problem either. Aren’t you lucky to be stuck with one of those bugs that effect a minority of users… an important minority, and very important to you! @gborn did a very thorough review of the issue, and the various fixes that have been suggested, in Microsoft confirms Access 97 MDB bug in Jet Database Engine caused by Windows January 2019 Updates. It does look like you are going to have to make up your own mind on how to handle this, because Microsoft hasn’t come up with an update to fix it. That leaves you with skipping this month’s updates, or applying them, and then trying the possible fixes and seeing if anything works for you, without messing up anything else. The MS support pages for the Rollup, Security Only, and Preview imply that if the column names in the databases are 32 characters or less that everything should work as normal. Hopefully, your column names are concise! From what I’m seeing in all these post’s, wouldn’t it be better to just wait until Feb. patches come out for Win 7 (especially with a home network like I and many others have)? Is there anything that’s critical for Jan. patches that really needs to be installed right now? These extra downloads/installs and/or registry fixes that MS is forcing on Win 7 is getting out of control!!!!! Are you using an AMD based computer and eager to get microcode updates? Are you having a problem with PowerShell remoting loop back using non-administrator accounts? We could all answer that last question if Microsoft provided more exact information, rather than a generalized quote. Isn’t it the update to the JET Database Engine that is causing all the Access 97 issues? Are you using Access 97? Are you part of a local “Administrators“ group that may not be able to remotely access shares on Windows Server 2008 R2 and Windows 7 if this is applied? No, not using AMD on Win 7 computer. Win 7 Pro, i7-3770 Ivy Bridge, Intel Gigabit network adapter and Qualcom Wireless adapter. I cloned my C drive first and made a restore point before checking WU. Installed KB 4480970 First then rebooted, with no ill effects on home network so far. Next, I installed KB 4481480 .net and MSRT, no reboot required. All seems ok for now, will have to wait and see if all stays the same. Just a followup to my post #319936, I noticed yesterday that following the updates on my Win 7 Pro, I could access my Win 10 computer on the network from my Win 7 computer but the Win 10 computer could not access the Win 7 computer even though the Win 7 computer showed up in File Explorer and I could ping the Win 7 computer but I just kept getting the message that the Win 7 mapped drive was not restored. So I ran KB 4487345 on the Win 7 computer and all seems to be ok now. Just a heads up on my experience with the updates. I have been installing KB 4487345 on all my networked Win7 computers as a matter of course. The other Win 7 Pro computer on the network only has a Shared Folder and the updates didn’t seem to affect that. The Shared folder seems to be available on all computers so evidently the update only affects Shared drives. Thanks for all the great advice. If we’re Group B Win 7 and have Office 2010, aside from installing Jan’s Security only patch for Win 7 and IE security patch (and usual MSRT patch), are you advising for us to not install any of January’s Office 2010 patches, or just only install the Office 2010 for Word and Office 2010 for Outlook patches and uncheck (leave alone) the other 2 patches for ‘Office 2010″? Thanks in advance for clarifying. Thx for the advice. Very appreciative. I went ahead and installed Jan’s Win7 Security only, Jan’s IE security patch, Jan’s MSRT, and the .net security patch (KB4481480). Woody (and/or other MVPs): regarding the Office 2010 patches, is it both advisable and safe to just install KB4461623 (Word 2010), KB4461625 (Outlook 2010), and KB4461617 (Office 2010), while avoiding (obviously) the KB4461614 (Office 2010) patch? Thanks in advance for your help. As always, very appreciative. I am running both 32-bit and 64-bit Office 2010 Pro. I have temporarily hidden both KB4461614 and the “fix” patch KB4462157 on both versions. Once MS gets the Japanese date problem fixed, I may unhide and install them (depending on whether they have been superseded or not). I have installed all the other Office 2010 updates. But this is not a recommendation, just a statement of what I have done personally. Frankly, I find that reasoning somewhat dubious. Considering all of the complaints about other versions, one would think that the stability alone of the one that they are trying hard (and succeeding from this user’s perspective) to make “better than all that came before” would be wanted above all else. Apart from an unfortunate debut, now long behind the current release, it and its updates have had very little to complain about in my experience. For anyone faced with any necessity for any version upgrade in the near future, the current W10.1809 release is definitely the one to go to IMO. Intermediate “stop-over” steps offer no advantage at all that I can discern. Frankly, I find that reasoning somewhat dubious. Restating the same argument does nothing for its logic or the lack thereof. The reality is that everyone is faced with the necessity that I mentioned for updating their W10 installations when support for older versions runs out. At that point it makes more sense IMO to base any mature decision on long-term stability factors rather than some counting of “bells and whistles” which, in fact, only add more opportunities for problems to arise. In any case, W10.1809 (“better than all that came before”) has no fewer features than any previous version. Furthermore upgrading to earlier versions resets many more user preferences than 1809 does and its re-enabling of restore points is hardly a major effort to deal with. So what exactly is the logical aversion, if any, to the 1809 upgrade in favour of other interim “stop-over” version upgrades as Woody seems to favor and as you appear to endorse? Rather than re-starting an argument, it is restating an issue that end users have to grapple with over and over again, and evaluate afresh with every feature update. This would be a plus for 1809. Problem is, personal users are fairly burned out on having their computer churning through updating, whether they are buggy or not, on Microsoft’s schedule. I only have one W10 computer, for about the last year, among all family and friends, so it is much less than a representative example… but deciding on a particular version is definitely less a mature decision than having something on right in front of us that is working right now, and being unwilling to mess with it, and hoping Microsoft won’t mess with it either, and dreading the future because you know they will. Being told, over and over again, that the latest updating is the best thing to do, but experiencing problems (which is why the rest of the family/friends group aren’t using W10, having given up entirely) when they followed Microsoft’s lead… well, gone from eager, to lack of enthusiasm, to dread. Even on this site, it is difficult to determine what is best, not for Microsoft, but for the computer in front of me. So my question is, if I have a somewhat stable version that is working for me, why I’d want to update until I absolutely have to… Even if it updates quicker, and will be more stable in the long run, why is that a reason to have to reset anything? If there is less to reset, it isn’t of much value, because I have to manually go through and find where things have switched to, and compare that to what I had and what I want… and there is no list of things I can ignore, knowing Microsoft won’t touch those, so I do have to go through everything. This is a bigger factor for single computer users, than for someone managing a large number, because they figure it out once, and then copy it, and it goes quickly from there. Microsoft’s defaults don’t suit anyone I know. No one. If I had a brand new computer in front of me (happened twice in the past 16 years) I’d look at the stability as a factor… but every six months, stability comes from keeping things as much the same as possible, and that doesn’t happen with feature updates. At least it hasn’t happened yet. Maybe the problem is that Microsoft wants to make things too easy for themselves, and judges things from their point of view… lots of tech people do want the newest toys, embrace change and want to explore what more can be done. But the grand kids have to do their homework, and there are things we need to compare prices on to buy, and I have expectations about being able to contact family and friends on-line… and my hobby of photo-editing, journaling, and organizing family history and making scrapbook pages gives me some needed down-time… and then, has Microsoft done anything about the things I care about? Is there one total off button for all telemetry? Can I turn off on-line features, including search, and still use my machine? Has Microsoft offered an operating system that allows me to opt into things I want, rather than have to figure out how to get rid of them? No? Well, then… what is the advantage to me and my family? So… since you have some insight as to details such as stability… that insight is valuable… and just because we aren’t jumping onto the 1809 bandwagon, doesn’t mean that those kind of facts won’t matter when it comes to looking at the next feature update and comparing it to 1809. Maybe too many people harbor a small hope that they can skip the hassles, and only go through them once a year, by choosing versions carefully. Anything you’ve got that would make the case for us having to all update right now, would probably be listened to… but it needs to be worthwhile for us, not advertising hype, and not bafflespeak… and certainly not saying its best for us, when it is demonstrably not. Psychology has long studied behavior modification through various rewards/punishments. There is something called the Premack principle that more probable behaviors will reinforce less probable behaviors, so you can shape behavior of animals and people. Unfortunately, what is positive for one person (new and better) may be negative (seen as useless change for the sake of change) for another. It seems W10 is way out of balance, reinforcing people like me, and those in my community, in a way that leads us to avoid updating as much as possible. That isn’t our fault, but the fault of the people who don’t see us as valued customers, but something to manipulate so they can earn big bonuses. What’s Microsoft done for me lately? – I’ve learned way more about operating systems and my computer than I’ve ever wanted to know. – I’ve learned where to go to get better information than what Microsoft provides. – I’ve clarified my values and decided that Microsoft does not offer products and services in line with them. – I’ve been thrust into learning new terminology and skills in order to approximate what I want and need from my computer in the future. – I’ve learned to research and test available options, going forward. – My grand kids already know more about computing and coding and what’s possible than I did three years ago. (c) 1809 has had more extensive pre-release testing of its LCU updates subsequent to its initial release. In such circumstances, one would expect anyone’s “heart for non-techy personal computer users” would favour the version that he himself thinks Microsoft is trying very hard to make “better than all that came before.” Why, specifically, is that not so? What does any earlier release “bring to the table” amongst Woody’s wants that isn’t provided by W10.1809 with its fewer reported problems and longer supported lifespan? Is it only because 1809 doesn’t bring more added features? If so, I find that evaluation dubious at best as I said. people who are faced with the necessity for updating their current W10 installation. Are you really curious? Those were logical, if not technical arguments, I presented, based on real life… and you brushed them away as if they didn’t address your question… weren’t pertinent to the discussion… and as long as tech oriented folk want to keep things simple (for them) and disregard the real lives of those who are tech users rather than developers or companies or Microsoft, I suppose you can disregard the rest of us, but it will leave you with your question unanswered. I’ve known people that ask questions like that, waiting for a different answer, or hoping those questioned would see the benefit and change their behavior (a superior attitude, supposing we should do things that way)… but it does sort of cut you off from the actual answers… and leaves you even farther away from helping us figure out how to deal with the mess Microsoft has made for us. I’m not trying to be difficult, these are the real things I struggle with when handed that family W10 computer and asked to help them with updating… when it doesn’t work, they will blame me, ’cause I was trying to help (not that it worked with what they were doing)… and I tried to honestly address why people around here have made the choices they’ve made, and what might be needed for them to move forward if something really is better. Woody does wait for things to shake out and prove themselves better, before advising the rest of us. 1809 is showing promise, from what you say… but it is realistically harder when we don’t have the skills to jump around testing stuff for ourselves, and have been badly abused, without a single good month of updating that I can recall, since ? Well, it certainly wasn’t good for the last 12 months… not on any OS. Woody has proven himself, and gives us directions that keep us safe, and keep our computers going… and respect our decisions, even if they diverge from his ideas of ‘best’. Maybe, soon, he’ll be recommending 1809… until then, keep reporting what works for you… we need people doing that… and you may inspire some to step up and try it for themselves. But asking ‘why’ we are cautious, and don’t move forward, when there is just so much history of things going wrong, even for the people that know what they are doing… that is a bit illogical, don’t you think? Good grief! I posted a very simple query asking about a published article stating that “My [Woody’s] skepticism stems from the fact that 1809 doesn’t bring to the table anything I want.” I simply asked why he would recommend against that particular W10 version in favor of upgrading to other earlier versions that bring nothing more, if not less, and that have been the subject of many more complaints including his own. In other words, exactly what does he want that is missing from 1809 but present in earlier version that he favors? That’s all. Yes I was “curious”, but an answer is certainly not worth this hassle. I thought that my straightforward question might possibly merit a straightforward answer from the author. I wasn’t expecting a defensive diatribe deploring the question itself. PLEASE forget I asked. Hello Arvy and Elly, You are both right, it is just you both are at the end of your righteousness! I agree with you Elly that MS may not give you the consumer just what you need or want. You had some fine statements and examples. Arvy, you are correct too and want to have a simple question answered. Let me TRY to help. Woody’s comment that there was not much to go for in 1809 is to say, that it is there and it is newer but nothing spectacular. It is not bad or dreadful either. So let it stay out for a while and see what happens. Is anyone screaming? Is there the standard “gnashing of teeth”? If not then he will probably say to go for it, most likely after one or two cumulative updates have gone out for it. So I will say Arvy there does not seem to be anything hideous, and Elly it is good to not jump on board as first in line, so wait, just a bit. My guess would be go for it on March 1st. But that is me and my feeling. I have windows 7 and I am sticking to it. Elly doesn’t use Windows 10 either. That explains a lot. I should have known. All I can say is that befuddled assertions about things like animal behaviour are difficult to accept as being at all relevant, let alone a “right answer”, in response to the very simple question that I actually asked. I would certainly hope and expect that published recommendations about the relative merits of various version upgrade possibilities couldn’t possibly be that irrational. They must surely have a more logical and solid technological foundation than that and that’s all I was asking about. But, as I said, I think it’s probably best just to ignore irrelevancies and let the issue go as unanswered. In any case, I’ll take it no further. As far as going through the settings and making sure nothing has been messed with, most of what I want not to change are the privacy settings. So I use O&O ShutUp 10 and make sure I have its configuration file exported and saved to an external hard drive or flash drive. Then, after any CU or Feature Update, I can just go back, reload the ShutUp 10 config. file, import the settings, and I’m back to normal. I also run the Intel Driver and Support Assistant after the updates, so as to restore any OEM drivers MS updates may have overridden. All in all, two button presses beats hunting and pecking, then going to a manufacturer’s website and downloading and reinstalling a bunch of drivers, every time MS gets a bee in their bonnet about how we all must use the same drivers and settings in Windows 10. What these steps cannot remedy is when older features I’ve used for years (decades?) like Disk Cleanup suddenly get “deprecated” or moved into Storage Sense or some such ridiculous place with an entirely different user interface. File Types Associations went that route some time ago with Windows 10. That kind of annoyance I can live without, thank you! So far as I can determine, W10.1809 adds no “deprecated” items to those that would also be encountered via the recommended “stop-over” route and its user preference changes are actually fewer. It does re-enable restore points which is a bit of a nuisance for those who rely on other better backup and recovery tools, but that’s easily dealt with. Disk cleanup is still there unchanged on the “General” tab for drive (mounted partition) properties. Just right-click the drive you want to clean and select “Properties” from the pop-up menu. “We’ve seen a few more problems raise their ugly heads in the past few days: Microsoft has confirmed that the latest version of Office Click-to-Run (which you’re likely using if you have Office 365) makes the conversation window disappear in Skype for Business 2016. This issue has been resolved in Office. If you are experiencing this issue, restart all open Office applications, or restart the computer. Installed January’s updates; IE KB4480965, SO KB4480960 and SO .NET 3.5.1 KB4480085 (for Group B) today. From the catalog; Installed IE KB4480965 1st, SO KB4480960 2nd, SO .NET 3.5.1 KB4480085 3rd and MSRT 4th. Saw the mscorsvw (process) run for several minutes after the .NET was installed. Time is drawing nigh though for us on 1709 before Microsoft will force 1809 on us…about two months from now. I just did the cumulative update for 1709 after Woody gave the “all clear” sign and things seem ok. The Silverlight patch is not one of those two that are meant to fix a problem with IE11 not displaying correctly calendar dates with the Japanese year in them. One needs the Silverlight patch if one has Windows 7 and uses IE11 for streaming videos from Netflix and some other sources. That is so because IE11 for Win 7 does not support watching streams that use the new HTML5 standard, such as those from Netflix. But IE11 for Windows 8.1 supports it, so Silverlight is not needed by Win 8.1 users. @OskarCP: Thanks for the insight – I had seen your comment, but missed to join in at that time (too much personal stuff I had to resolve). Concerning the thing that update seems to fix: Whilst the japanese calendar thing is confirmed from Microsoft’s kb article, I wasn’t able to find any clue about the IE 11 streaming fix you mentioned. Do you have a source link? Or where do you got the insights? BTW: Silverlight is declared from Microsoft as deprecated – had a blog post a while ago about that. PS: I have now cross linked the German and English blog posts, you you can also read the English one. So, please, find there my correction and some additional related thoughts. And thanks for taking the time to check with me on this. These are busy days for you, no doubt. While MS continue to support Silverlight in IE10/11 for another 2-3 years, Firefox and Chrome new browser releases haven’t supported it for a couple of years now. Some older ESR versions of Firefox in 32-bit can still use Silverlight, where it is still necessary (some SaaS platforms require Silverlight still). This Sliverlight death-spiral sounds to me a lot like what Adobe is going through with Flash Player being deprecated within the next three years, and Oracle already abandoning Java Runtimes. (LibreOffice has already stopped requiring Java Runtimes for any of its features.) Fewer security and updating headaches for us, less user support for them to handle. Sounds like a win-win on all fronts to me. I’ve this morning installed the monthly rollup and .Net Framework patches on the first of my two Windows 7 x64 home desktop PCs, and if all goes well over the next day or two I’ll install them on the other machine. I’ve hidden the MSRT as I no longer install that. That just leaves the 6 Office 2010 updates on the first machine, including the troublesome one that is unchecked and therefore won’t be installed anyway. I’m seeing conflicting advice on whether or not to install the remaining ones but will leave them for the moment and may simply hide the lot until next month. Thanks as always to Woody, Susan and everyone for their invaluable advice and comments. All seems well. Thanks always Woody & Crew. Why do I get KB4023057 once a week starting in 11.2018? I uninstall the current installed 057 and than install the new 057. Running Windows 10 Pro 1803, Semi-Annual Channel, Feature Updates.. set to 365 days, Quality Updates.. set to 21 days. a Kb4480063 was also installed ??? Computer rebooted and no issues. See the MS pages on KB4481480. Kb4481480 .net rollup is a bundle. It contains separate patches for each version of .NET. These separate patches do not have the same KB number as the bundle. Kb4480063 is the separate patch for .NET 3.5.1. What you see in the Update History is probably the Rollup KB number, but if you look in the Installed Updates, you will see the individual patches. In a shocking development just moments ago it was announced that there is at least one Win7 Pro sp1 x64 machine for which the installation of a Security Only patch (to wit, KB4480960) did NOT – repeat did NOT – require a Windows Media Player reset, breaking a string of 5 consecutive months in which such installation DID require a WMP reset. It is not immediately clear whether this highly unusual occurrence is a mere fluke or an indication, no matter how small, that an MS patch was designed to actually work. 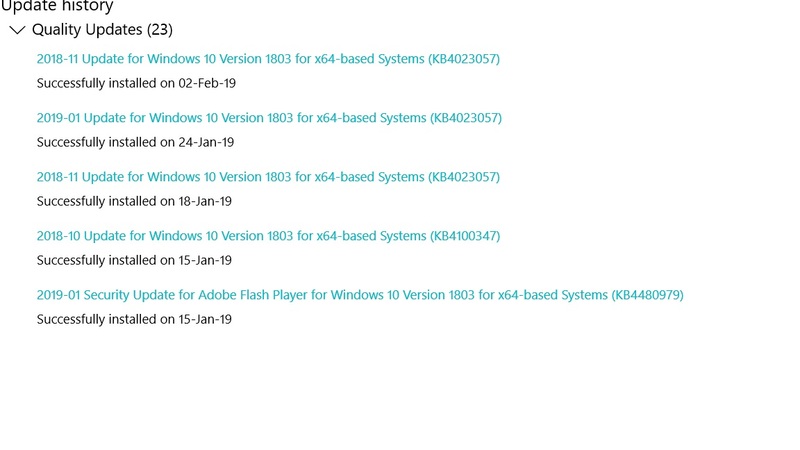 For those interested in pursuing this matter please note that prior to the SO installation, the following January patches were installed in the following order, with a restart after each (whether required or not) and a waiting period of 15 minutes between successive installations: IE 11 (KB4480965), Silverlight (KB 4481252), and .NET (KB4481480). So we have 2 home use laptops in our house (both connected to the same router, wirelessly), both Group A Windows 7 home premium 64bit. After all the confusion (to the average user like myself who is almost completely nothing about computers) about January’s updates I finally decide to bite the bullet and I installed ONE (YES, you read that right) ONE update. KB4480970, the Security Monthly Quality Rollup for Windows 7 on my husbands laptop, it downloaded and installed after about 25mins, I hit restart and it has now been STUCK on “Preparing to Configure Windows……Do Not Turn Off Your Computer” for the last 20 minutes……..Please Help!! What should I do????? HH33 says: “After spending a full hour in “amnesia mode,” the computer suddenly went into Windows normally of its own free will and accord.” and Gone To Plaid has good advice to read. Thanks for the advice and the link Lars220. It did in fact take the full hour to finish configuring the update. As I said above I am not real knowledgeable about computer stuff and I have read GTP’s post but not sure of exactly what to do. I am one of those that needs simple step by step instructions or a video to watch in order to follow things like that. It was late when the update finally configured and by that time I was too scared and frustrated to try to do any more updates on my husband’s laptop or even think of starting my own. I am going away for 3 days to visit my mother so I will have to deal with finishing his and then do mine when I get back home. Could someone give me peace of mind and tell me why the file hashes for the IE update (KB4480965) listed here – https://support.microsoft.com/en-gb/help/4480965/cumulative-security-update-for-internet-explorer – don’t match the update itself? I always check this when downloading it and now there’s a mismatch which makes me wary. All i can think is microsoft’s documentation is again screwed up because the page is dated january 8 yet the date in the catalogue is january 4. I should note that the SHA1 hash for the update itself does match the filename it’s just the documentation page where there’s a discrepancy. Bonus: As others have already reported, no need to reconfigure Windows Media Player this time! Thanks once again to Woody, PKCano, and all the other folks here who contribute their time and expertise! WU offered KB4480970, KB4481480, and KB890830 all as Important and checked items. After imaging and disk cleanups, I proceeded to install each item (one at a time with restarts and waits between each until I saw TrustedInstaller conclude). Hello SueW and Blizzard, Thank you for your posts and letting people know your results. I am please to see people are letting their computers sit idle – to allow Process Idle Tasks to perform – and for rebooting several times at the end of the update procedure. Some may wonder why, but I have seen for years that the computer forces processes to end and get written to disk, forces the registry to write to disk and recover faster. The 45 minute sit idle finishes any leftovers. I would recommend people run disk defragmenter on a rotating drive and TRIM (optimize) on an SSD. In order to get the KB4476976 CU offered and installed, I had to set all Deference to 0 days, both for Feature and Quality updates! Does CUs now count as feature updates, or did I do something wrong??? Think in terms of Win7. The Monthly Rollup is issued on Patch Tuesday. The ROLLUP appears as a CHECKED Important update in Windows Update. Later in the month, the Monthly Preview appears as an UNCHECKED Optional update in Windows Update.The Rollup is installed, but the Preview does not get installed unless you have a special need and you check it. Now Win10. You probably have set SAC and defer Quality Updates. Qulaity updates are like the Rollups in Win7. They are issued on Patch Tues and are defered (or not) by your settings. The CU issued on Patch Tuesday (for your version 1803, was KB4480966. The second CU of the month, KB4480976, was issued on 1/15 and is like the Preview in Win7. It does not get installed (or even seen) if you have your settings at SAC and the deferral time means nothing because this is not the main CU of the month. Think Unchecked Optional. If you want the Preview patches, you need to set SAC(Targeted) and no deferal – that is like “hit me with everything,” and even then you may have to go looking for it. Nothing blew up, thank Heaven. The file was checked. Should I install it? Yes, install KB3177467. That is the latest Servicing Stack. Thanks again. Don’t know what I’d do without you guys. I am confused about how to handle KB971033. There are a lot of posts about uninstalling it and a lot about leaving it alone. KB971033 is a Windows Activation update. KB971033 was released in 2010, has never been revised since then and has no relation at all to the current updates. And try to avoid KB971033 if you don’t have activation issues. If you aren’t installing it, the local advice is to hide it (as mentioned in ch100’s topic link above). KB971033 has been installed for years. For what it’s worth, I have one Win 7 Pro sp1 x64 machine with the KB971033 update on it (installed on 8/1/14, before I started taking care of the machine). I finished updating it last night with the Security Only update (KB4480960) and everything worked just fine. None of my other similar machines have the update and they all updated just fine, as well. KB4480963 (Monthly Quality roll up for Win 8.1) cannot get installed, throws up error 80200056. Please start a new topic in the appropriate support forum with further info on PC, updates installed, AV etc.. I installed the patches as recommended, on two PCs (G and C). After installing on G, it could see C. After installing on C, neither could see each other. Win7 came up with “Not accessible” messages. Both access the other as administrators. A re boot of each did not help. The network itself is fine – I can see my Synology NAS from both. I then went after KB4489345. In both cases, attempted installation failed “This update is not applicable to your computer. You meant KB4487345? not 9345? right? Look very carefully at the file name for KB4487345. If it has “x64” in the name, it’s for 64-bit. If it does not have “x64” in the name, or if it has “x86″ in the name, it is for 32-bit. If you get the bitedness wrong you could very well get “This update is not applicable to your computer” when you tried to install it. If you are not familiar with downloading updates from the Catalog, you could easily make that mistake. Be sure you have the right patch. PKCano – yes I have picked up the 32 bit version, now I look closely. Thanks. I’ll have another go in the morning – it’s getting late now. Thanks for your help PKCano – it’s all fixed now. I had made exactly the mistake you thought I had (please try to pay attention next time, Chris)! Elly – yes 7345. Sorry about the fat finger. Is there a reason why KB4480970 and KB4480955 seem to fail? They are for server 2008 R2, and they are running through WSUS. The other strange thing is the server says Up To Date. Do you have the latest version (Oct 2018) of the Servicing Stack KB3177467 installed? If not, install it first and exclusively (by itself). Yes, that update has been installed. Mine installed just fine. What’s the error code you are getting? Error Code is 80242016. Like I said earlier it failed but said was Up To Date. It almost seem like it wasn’t needed.